New Delhi (IANS): BJP president Amit Shah on Wednesday made a major re-shuffle in the party organisation by appointing three vice presidents, three general secretaries, including Madhya Pradesh minister Kailash Vijayvargiya, and four secretaries. Former Bharatiya Janata Party general secretary Om Mathur, who spearheaded the party’s campaign in Maharashtra, was appointed vice president while Shyam Jaju was elevated to the post of vice president from secretary. Former BJP Punjab unit president Avinash Rai Khanna was also appointed vice president. The most significant appointment was of Vijayvargiya, who helped the party score a win in Haryana on its own for the first time, as general secretary. Arun Singh, a relative of union Home Minister Rajnath Singh, was elevated to the post of general secretary from secretary. Anil Jain, who was secretary in charge of the party affairs in Haryana, was also promoted as general secretary. Former president of the BJP’s Odisha unit Suresh Pujari, in-charge of Assam Mahendra Singh, East Delhi MP Maheish Girri and the party’s Jammu and Kashmir unit spokesperson Farooq Khan were appointed as secretaries. 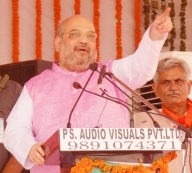 Shah was under tremendous pressure to fill positions after many of the party office-bearers were made ministers in November. From among party vice presidents, Bandaru Dattatreya was made minister of state (independent charge) for labour and employment, and Mukhtar Abbas Naqvi was made minority affairs minister in the central government. Raghuvar Das became chief minister of Jharkhand and Kiran Maheshwari was inducted into Vasundhara Raje’s government in Rajasthan as a cabinet minister. Similarly general secretaries J.P. Nadda was made union health minister, Rajiv Pratap Rudy was made minister of state (independent charge) for skill and entrepreneurship. Ramshankar Katheria was given responsibility as minister of state for human resource development. Despite the appointments made on Wednesday, three posts of vice presidents and two posts of general secretaries are lying vacant. According to the party constitution, the BJP president can appoint not more than 13 vice presidents, nine general secretaries and 15 secretaries.